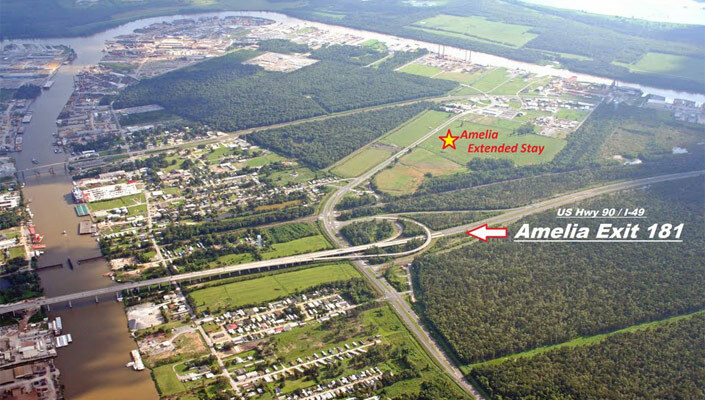 The Amelia Extended Stay & Hotel is located along Duhon Blvd., just south of Hwy. 90, at exit 181 in Amelia, Louisiana, between Morgan City and Houma, Louisiana. On the eastern side of St. Mary Parish, Amelia is the hub for oil and gas exploration in the Gulf of Mexico and inland waters. Much of the marine fabrication for offshore rigs, platforms, and pipelines is performed in the Amelia, Morgan City, and Houma areas. Amelia is also a major location for the fabrication, repair, and maintenance of offshore supply vessels and crew boats. Companies such as McDermott, Bollinger Marine, Conrad Shipyards, Swiftships, Tuboscope, Allison Marine, PHI (Petroleum Helicopters Inc.), Transocean, Oceaneering, and Bay Offshore all call St. Mary Parish home. In addition to the numerous oil and gas related industries in the area, there are many other businesses such as the Amelia Belle Casino, Teche Regional Medical Center, and Young Memorial Technical College. The Coast Guard also has a major presence in the area. St. Mary Parish is famous for its festivals, such as the Shrimp and Petroleum Festival in nearby Morgan City. It is this unique mix of combining business with pleasure that sets Amelia and St. Mary Parish apart from just about anywhere else in the world!